The Kindle is widely regarded as being responsible for igniting the ebook era, but the idea had been around for at least 30 years before the Kindle launched in November 2007. There were a number of marginally successful ereaders and ebook platforms before the Kindle, including the Sony Data Discman, Rocket eBook, and there was even a joint B&N-Microsoft effort during the late 90s tech bubble. And then there were the ebooks produced by Voyager Company in the early 1990s and distributed on floppy disks (and later, CDs). These were early enhanced ebooks called (appropriately enough) Expanded Books (Wikipedia). A wide variety of titles were released as Expanded Books, including A Hard Day’s Night, Art Spiegelman Maus, Zen and the Art of Motorcycle Maintenance, and A Wrinkle in Time. In addition to the text of the book, an Expanded Book also had audio, animation, links from various parts of the text to supplemental content. All of this content was bundled with the disk, obviously; this was the pre-internet era. Expanded Books was perhaps the very first attempt to develop enhanced ebooks. This was before my time, but I’m told the project did produce a number of titles including The Complete Hitchhiker’s Guide to the Galaxy, The Complete Annotated Alice, Jurassic Park and The Tao of Pooh / The Te of Piglet, the last of which is still available on Amazon as a 3.5? floppy disk. 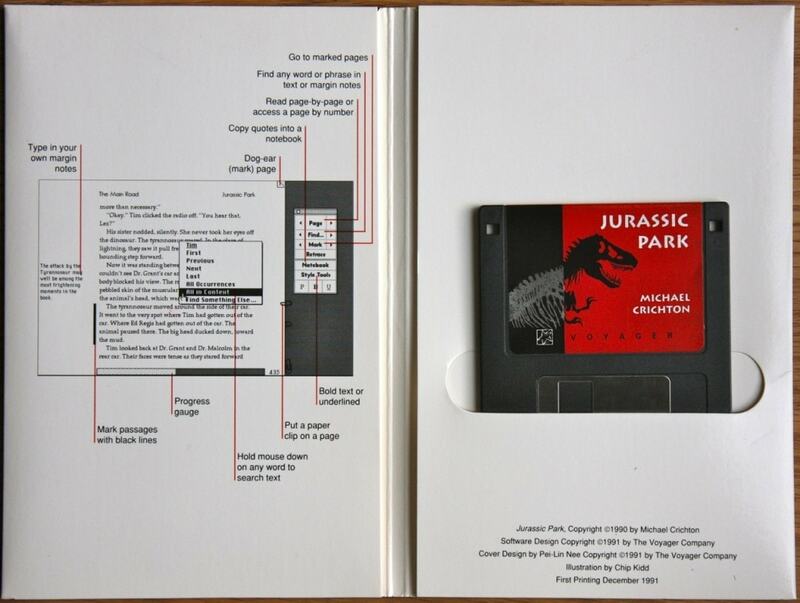 The ebooks were built to run in Hypercard and included such amazing features as embedded audio and images, multiple font sizes, bookmarks, typed notes, search, and what at the time was considered clever menu design. Voyager produced around 60 titles as well as a tool kit for authors and publishers to produce their own ebooks. According to the 1996 edition of The Art of Electronic Publishing, Voyager sold the ebooks for $20 each, with some multi-volume sets priced at $25. This ebook format never amounted to much because the idea was too new, too expensive, and because it only ran on Macs (not a common OS back then, or for that matter now). Expanded Books were dependent on Apple's proprietary Hypercard programming language (here's Ars Technica with more info on Hypercard). This ebook was released in 1995, so it's not quite 20 years ago, but I think you get the point. The work Voyager was doing 20 years ago was not a whole lot different from a current ebook app, is it? Sure, the video is lower resolution and the interface is dated, but the content added to the original text isn't terribly different from enhance ebooks today. The above video is just one of a couple dozen promo videos that Bob Stein uploaded to Vimeo. He was one of the co-founders of Voyager and clearly he is also a packrat, for which I will be eternally grateful. You forgot to mention one of the most fascinating things about Voyager Books: Bob Stein was also the guy behind Criterion Collection laserdiscs, which were the first laserdiscs to feature things like extras, including commentary tracks. So the same man responsible for enhanced e-books is also responsible for the “enhancements” we take for granted today on DVDs and Blu-Rays. A lot of good children’s educational software was produced on hyper card. All my kids remember playing Reader Rabbit and others on the Mac Plus. They were quickly creating their own stacks. It served them well. This brings back memories. 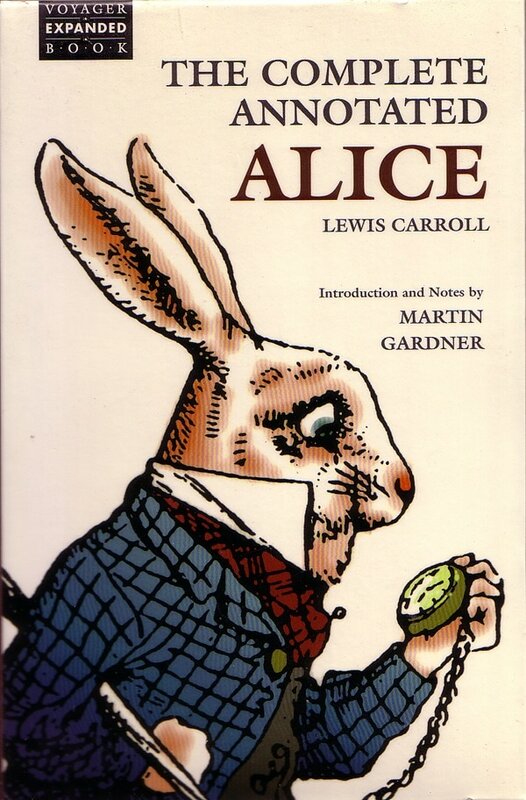 I have a Hiebook device in my closet with half a dozen ebooks loaded including Alice. Also, I have a copy of the Microsoft Reader (their own format) from 2003 and, of course, one of the original Adobe Reader (PDF). I am afraid that the Kindle will be in reader’s closets in the future. Amazon’s propriety format seals that fate. Can you see Amazon trying to convert their ebooks to another format? That would make the Gutenberg Project look like a recess exercise. I programmed the Expanded Books software and co-programmed the Toolkit for them too. What Chris Meadows says is true, we were making the forerunner of DVD-Video. In addition to the Gould one I programmed at least three CD-ROMs that were interactive versions of the laserdiscs that Voyager published under the Criterion label: A Hard Day’s Night, This Is Spinal Tap, and The Day After Trinity. It’s interesting that I could do those as web apps now, given that Internet speeds are at last faster than CD-ROM.